The Nordic countries are five sovereign states, Denmark, Finland, Iceland, Norway and Sweden and three autonomous territories: the Faroe Islands and Greenland (both Danish) and the Åland Islands (Finnish). These countries have together about 23 million inhabitants, ranging from 250,000 in Iceland to 8 million in Sweden. - In general, the term Nordic is used for all five countries in this area, while the term Scandinavian,strichtly speaking, refers to Denmark, Norway and Sweden. The Scandinavian languages Danish, Norwegian and Swedish are similar enough for direct communication. Modern Icelandic and Faroese are more distant, and Icelandic as well as Faroese people have to speak one of the Scandinavian languages to be understood in other Nordic countries. Finnish is a Fenno-Ungrian language and cannot be understood by Scandinavians. Finland has a Swedish-speaking minority (approx. 6%) and Swedish is a compulsary subject in Finnish schools. Thus communication within the Nordic community is mostly in Scandinavian languages. In addition, the Greenlandic and Sami peoples have languages of their own and/or own cultural traditions. "The region has has many variants of a common culture and many interest groups. The Nordic people and their politically elected representatives want to maintain this diversity. But they do have a common basic philosophy and they wish to work together. Nordic co-operation is not directed against anyone else. The region simply wishes to show how independent states can forge a common future. 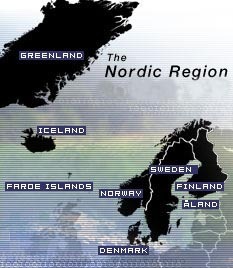 Nordic co-operation is unique in that it often goes on on an unofficial basis, without red tape. Government agencies, local authorities, institutions, and organizations in the Nordic countries can co-operate directly with their Nordic counterparts at all levels. And they do. Nordic co-operation is a matter of benefiting from one another s knowledge and experience. Exchanges of information and views are free and informal. Political parties, trade unions, interest groups, and voluntary organizations find it perfectly natural to have Nordic umbrella organizations and hold Nordic conferences at which to swap ideas. Nordic co-operation is so natural and so diverse that we do not always realize that it is unique."